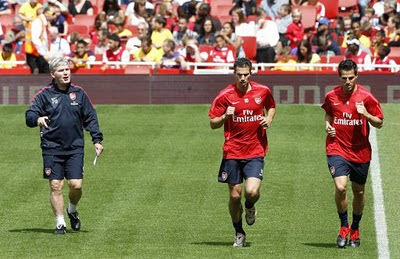 Cesc Fabregas and Robin van Persie have returned from illness and will be fit to play Wolves tomorrow. Arsene Wenger confirmed that the Arsenal captain and vice captain would be available for selection against the Premier League's bottom side. Earlier in the day Johan Djourou successfully completed a fitness test and is in contention to start. Denilson, who injured his hamstring in the FA Cup tie with Huddersfield Town, will also return. Abou Diaby is suspended while Tomas Rosicky has a groin problem, so will miss the game.